With D-Street riding a crest, stocks across sectors posted handsome gains. In the BSE 500 index, which gained 9 percent in 1 month, 30 stocks rallied in the range of 30 percent to 99 percent, which also include stocks that singed in September and October due to factors such as corporate governance issues, liquidity crisis and mixed earnings. Suzlon Energy, Manpasand Beverages, Dilip Buildcon, Edelweiss Financial, CG Power, Bombay Dyeing, Adani Power, Allahabad Bank, Mahindra Holidays, NBCC, IRB Infrastructure, Just Dial, ICICI Securities, Kalpataru Power Transmission and Can Fin Homes were among the top 30 stocks. On hopes of Modi government returning to power, FIIs are also in a bullish mood. “After the clarity on the election results and earnings pickup, we feel, FIIs will do historic investments this year,” Foram Parekh, Fundamental Analyst – Equity, Indiabulls Ventures, told Moneycontrol. 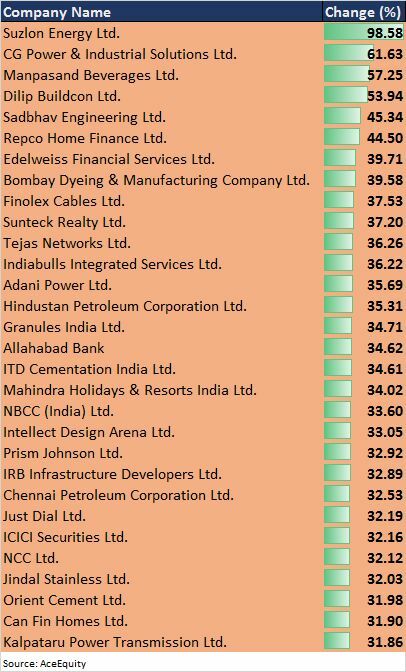 The most favoured stocks in this run were among midcaps and smallcaps. In Nifty50, top four stocks were from PSU segment. They were HPCL (up 35 percent), IOC (up 29 percent), BPCL (21 percent) and NTPC (21 percent) while the rest five among top 10 stocks were from banking and financial segment. Yes Bank, Bajaj Finserv, IndusInd Bank, ICICI Bank and SBI gained 15-17 percent.